Concealers For under Eyes and Sculpting. Use a foundation brush for a refined professional finish. 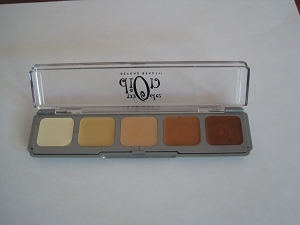 Five Color Pro Concealer Pallet A must for concealing every imperfection and enhancing skin tone. 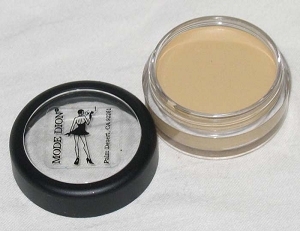 Use to custom blend concealing imperfections, to contour and to warm the skin tone. Has Golden Light & Medium Beige, Warm Bronze for a tan look and Deep Bronze for contouring. 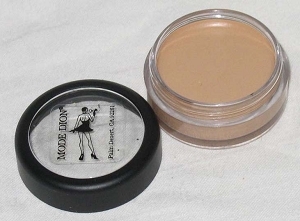 Perfect for Ebony skin tones custom blend concealing. Amber Pot A golden toned medium shade cover cream for concealing dark under eye circles, brightening eye area and hiding imperfections. Important for shadows around eyes created by stage lights. Very long lasting product. For medium to tan skin tones. Light Amber Concealer Pot A golden toned light cover cream for concealing dark under eye circles, brightening eye area and hiding imperfections. Important for shadows around eyes created by stage lights. Very long lasting product. For fair skin tones. Petrolatum, PPG-2 Myristyl Ether Propionate, Polyglyceryl-3 Diisostearate, Isopropyl Palmitate, Hydrogenated Castor Oil, Silica, Squalane, Kaolin, Nylon-12, Ceresin, Carthamus Tinctorius (Safflower) Seed Oil, Dimethicone, Tocopherol, Methylparaben, Propylparaben, Ascorbyl Palmitate. May Contain (+/-): Mica, Titanium Dioxide (CI 77891), Iron Oxides (CI 77491, CI 77492, CI 77499), Ultramarines (CI 77007), Chromium Oxide Greens (CI 77288), Chromium Hydroxide Green (CI 77289).